I don’t know about you, but it’s been a HOT summer so far! Even though we live in the South, we still live in the mountains, so our summers are a bit milder than the rest of the South. This summer though, has been hotter than I remember it being in years past. We had days in the 90’s in early June which is NOT normal! During these hot days, I try to keep some fun snacks in the freezer on hand for our family. 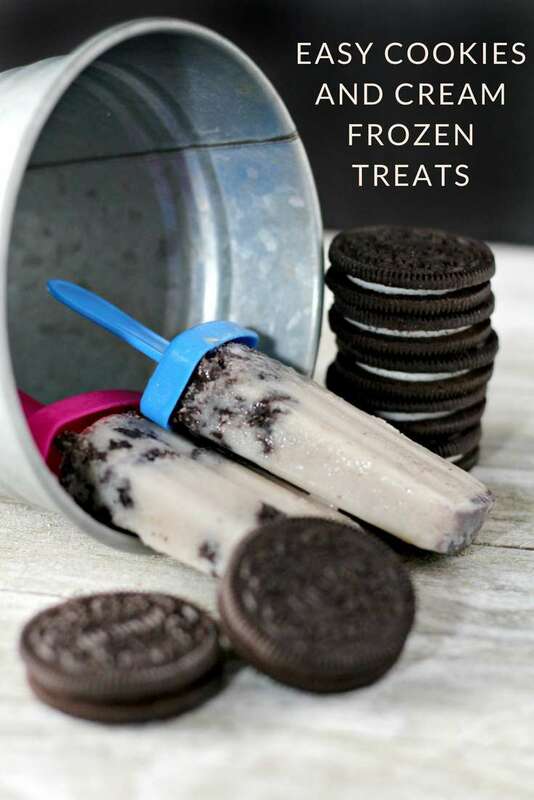 These Easy Cookies and Cream Frozen Treats are a semi-healthy treat for the hottest days! Popsicle Molds I found mine at Wal-Mart for $1.00. Start by placing frozen yogurt, almond milk, and vanilla in the blender, and blend on high until smooth. If mixture is thick, add 1/2 cup more of almond milk. Place Oreos in zip lock bag and crush them with a rolling pin or your hand. Pour crushed Oreos in you blender and stir by hand. Pour mixture into popsicle molds and freeze for several hours, until frozen solid. You may need to let them sit out for about 5 minutes to make them easier to pull from the molds.